The Keysight E4438C is available to buy refurbished used or rent, usually from our UK stock. Click here to download the Keysight E4438C datasheet. The Agilent E4438C ESG vector signal generator meets the needs of engineers who are designing and developing the next generation of wireless communication systems and is well suited for production test environments. An assortment of standards-based receiver and component test software for 3G and emerging communications formats are available to simplify the signal configuration process. The E4438C ESG vector signal generators performance, extended frequency range, increased memory for waveform playback and storage, and application-specific personalities make it the clear choice for development and manufacturing from the component to the system level. We offer the refurbished used Keysight (Agilent) E4438C 1, 2, 3, 4 Or 6GHz ESG Vector Signal Generator for sale and rental. 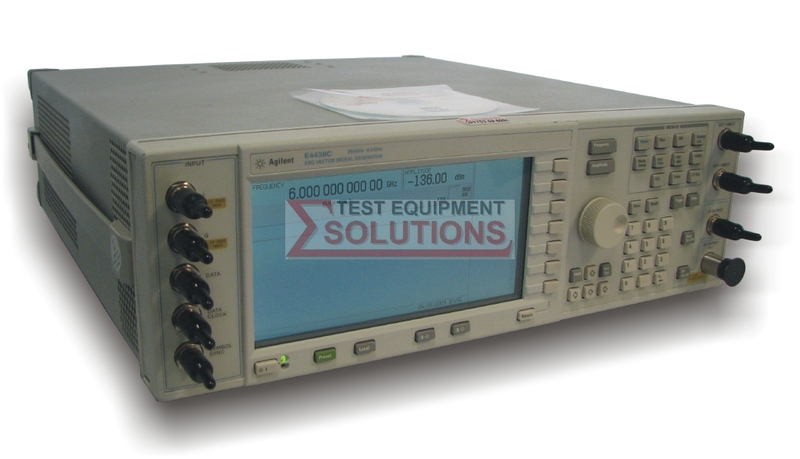 The Keysight E4438C is fully tested and refurbished in our in-house ISO9001 calibration laboratory. We supply manuals, accessories, full warranty and a free-of-charge Certificate of Conformity. We can also provide the Keysight E4438C with a fresh calibration for a small additional charge. If you have under-utilised test equipment talk to us about trading-in or part-exchanging it towards the Keysight E4438C or other refurbished test equipment.